I am pleased to announce that my Cisco Kid prints are now to be shown in Pittsburgh and I shall also be giving an Artists talk as as part of The Pittsburgh Fringe Festival. I am really pleased to announce that my Cisco Kid prints are headed to Downtown, Nashville, Tennessee for most of July, to be shown at The Rymer Gallery. I am truly honoured to announce that my painting “For Jock Scot” has been accepted and will be shown in the 250th Royal Academy Summer Exhibition. Click here for details. I have been asked to once again contribute to The Secret 7″ charity show and this year I will be in familiar company with pals Ian Wright, Josh Cheuse, Jules Balme, Paul Simonon, Pennie Smith and Ruth Franklin all showing. Click here for details. I am returning to Decatur, GA, for my second solo exhibition with Shawn Vinson, but my first in the Atlanta area showing my Cisco Kid prints. For more information click here. At 6PM this Saturday, October 14th, I will give an Artists Gallery Talk at Lost Origin in D.C., which will be followed by a Q &A session, should any of those in attendance have any questions. Seating will be limited, so if you want to sit down it’s best to RSVP. I have four “protest” postcards in a group show at Different Trains Gallery, Decatur GA. I was invited to contribute some photo-based “protest” work by Shawn Vinson and as soon as he told me Jim Alexander was in it, I said yes. It’s an honor to be in the same show as Jim and I recommend everyone check out his photography. Thanks to the efforts of Mark Anderson (Positive Force D.C.) and Jason Hamacher (Lost Origins) prints from my Instagram “installation” Cisco Kid vs. Donald Trump will be on show in Washington DC in October. I will be there at weekends too. For more information click here. I am happy to announce that once again I have a piece in a group show at Contains Art. The subject of the show is H.G.Wells “Time Machine” and my piece is titled “Weena” (watercolor and assemblage).It will also appear in the publication of a new illustrated edition of the book. As part of our exhibition Jack Logan and I will be giving a talk. Click here for details. All through June & July The Lyndon House Arts Center will be showing an exhibition of postcards by myself and cartoonist/songwriter Jack Logan. For more information click here. Thanks to the efforts of film maker Sara Driver, I am to be part of this years Spring Break Art Show, which is to take place on two floors of the old Conde Nast building – 4 Times Square. My floor used to be the offices of Vanity Fair and I will be showing a selection of prints from my ongoing Cisco Kid Vs.Donald Trump series. For more information click here. Nov 20th -Jan 29th 2017. Thanks to the effort of Shawn Vinson (VinsonArt) and the support of ArtsATLand various other good folks, I will be at the Decatur Book Fair this Labor Day Weekend. We will be presenting a live “on site” screen printing of a special Cisco image and prints will be given away. On June 1st I started this new “artistic adventure” on Instagram in protest of the Republican Nominee for President. It has been said that “all bad people need to succeed is for good people to do nothing” and so I’ve decided to do something and I will keep doing it until the Presidential Election is over in November. If you don’t Instagram you cash check it out here. I am happy to announce my return to Contains Art, this for a group show on the subject of Shakespeare’s “The Tempest”. I have one piece in the show, which is pictured above and titled “Mercy” (assemblage featuring child’s life vest, acrylic paint and various “gris gris”). It will as also appear in the publication of a new edition of the play. I got invited back by Kevin King and the Secret 7″ posse,to participate in this year’s show for the benefit of Amnesty International. Being as the Sale Day has already passed I can reveal my choice and my effort to make a cover for it :”Art School” by The Jam. Just like last year Supremes’ cover, I have no idea who owns it ? For more info click here. I was invited by famed photographer and old pal Janette Beckman to contribute a “Punk Rock Mash Up” for her show in London. I managed to persuade Janette to let me have two of her “Islington Twins” photos, and my contribution can be seen above. 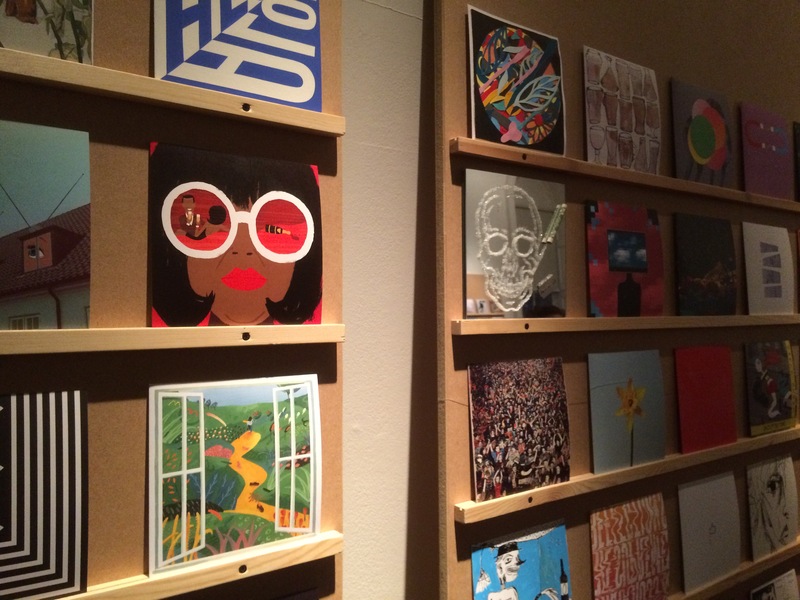 The Punk Rock Mash Ups are an addition to the Hip Hop ones that debuted (to much applause) at The Museum Of The City Of New York. If you’re in or visiting London do take a look. Earlier this year I was interviewed for Joe England’s literary fanzine Push (March/April issue #15). Well now East London Press have published their second compilation of this hard hitting fanzine “PUSH 2”. Not only is my interview included but I am also credited with the Cover Design. I would however like to point out that it is in fact a tribute to both Edward “Teddy” Young’s Penguin Book design and an obscure West Ham away shirt. Even this could not be accomplished without the help of Graham Want. 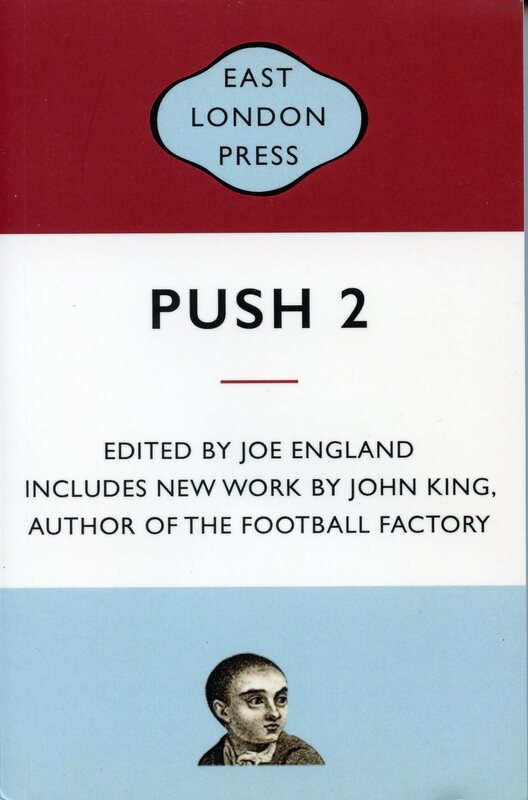 “PUSH 2” contains some very excellent writing, referred to by some as “street literature” it is not for the faint hearted – as Big Youth would say “Lightning flash and weak heart drops”. For more info click here. The “secret” is out and the sleeve is sold (to the gentleman pictured above I assume). I chose Diana Ross & The Supremes “Reflections” a favorite since it’s release in 1967. My cover star is Donyale Luna (worthy of further investigation) with special guests: front – an American GI from the Vietnam War and back – rifle laden Newark, N.J. police car. To see both sides of the sleeve click here or on the picture above.